Pull up a chair (and buy it!) at funky new eatery. The Eklektik, that's just a few months old, might be the most appropriately named business in town. Its full name is The Eklektik Soul Kitchen, Brews and Store, and it's not immediately apparent as you walk up to the place that you're even anywhere near a restaurant. It looks more like a consignment shop and art space—which it partly is. Most of the seating is toward the rear of the colorful space, past a slightly raised area with an array of items for sale, ranging from clothing and jewelry to local art and just about anything else you could imagine. In fact, there's not much in the place that isn't for sale. According to the owners, every chair and table in the eatery was once "someone's throwaway," which was restored and is now up for grabs. If you really like the table and chairs you're using here, you can take them home with you. And that goes for just about everything else, except probably the kitchen sink. The menu, like the restaurant's visual style—with legs and upper bodies of mannequins jutting out from the walls—is whimsical. It fishtails with the logic of a Dalí painting, and offers dishes like traditional French onion soup ($7), Spanish-style patatas bravas ($12), lump crab macaroni-and-cheese ($14) and a Caprese salad with goat cheese in the place of traditional mozzarella ($10). The eclecticism is a natural byproduct of the owners' unique personalities and tastes. Aliza Levy Sidi is a former Mexico City TV producer, cook, artist, restaurateur and self-described "fashionista." Her husband, Sion Croudo, operated restaurants in Mexico City's Zona Rosa and in San Diego. He's also a die-hard music aficionado. Virtually everything in their unique restaurant is recycled, repurposed, sustainable and environmentally friendly. Glassware (not to mention ceiling lighting) is made from upcycled lamps and bottles. With a menu that captures the couple's love of dishes from around the world, and sometimes from "Grandma's traditional recipes," their motto is, "Cooking with love provides food for the soul." Well said. From the "First Things First" section of the menu, I particularly enjoyed the chicken salad tostadas ($10). The trio of lightly fried corn tortillas is topped with pulled boneless chicken breast tossed with a delicate house chile-mayo, lettuce and corn. Each tostada comes with a different garnish: sliced avocado, pineapple and pico de gallo alongside a scrumptious and mildly hot sauce. At first glance, the Barcelona shrimp cazuela ($19) looked a tad skimpy. I was wrong; there are plentiful shrimp buried beneath eight slices of toasted baguette and garlicky sauce. 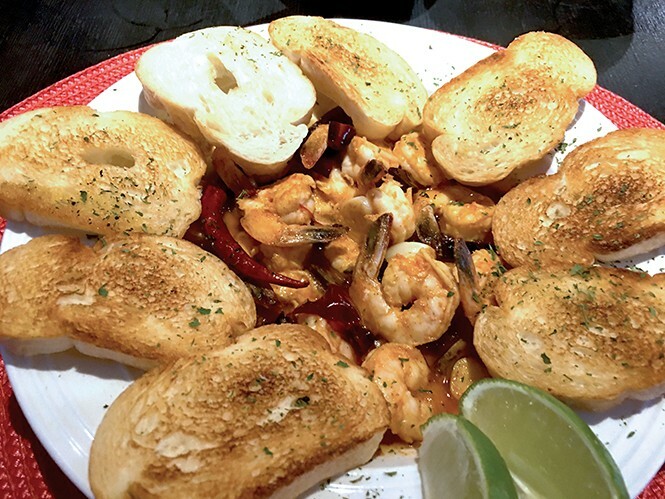 It's a Spanish-style one-pot dish—cazuela means "pot" in Spanish—of about 18-20 small shrimp bathed in a sassy garlic and guajillo chile sauce with extra virgin olive oil and some chile de árbol thrown in to add a little zing. The generous serving of bread ensures that you won't have to let any of that sensational sauce go to waste. Tilapia Rodrigo ($13) isn't what I expected—it's even better. Rather than a boring filet, the tilapia is minced and served in a terrine with a mélange of jalapeños, scallions, cilantro, lime juice, olive oil, salt and pepper, avocado slices and five fresh corn tortillas on the side. It's simply delicious. In response to my begging off dessert, Croudo responded, "I didn't ask if you were full—I asked if you like dessert." He didn't know who I was, but insisted on serving us (gratis) a memorable, citrusy tiramisu ($7) before we left. I'll never turn down dessert at The Eklektik again.